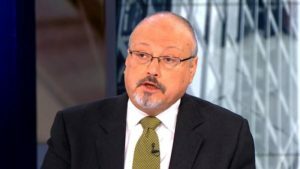 Saudi journalist Jamal Khashoggi, who fled the country last year after emerging as a critic of the government, has gone missing after he entered the Saudi consulate in Istanbul, Turkey, for paperwork on Tuesday. Khashoggi, according to his Turkish fiancée who accompanied him to the consulate, did not come out after entering the diplomatic mission to secure documentation of his divorce so that he could remarry, Reuters reports. “I don’t know what’s happening. I don’t know if he’s inside or if they took him somewhere else,” the fiancée who asked not to be named told Reuters by telephone after waiting 7 hours and half outside the compound. She called Turkish police to investigate the incident. Khashoggi, a former newspaper editor and political commentator flew to the U.S. in September last year on a self-imposed exile. He has written several columns in the Washington Post slamming the kingdom’s policies towards Qatar, Yemen and Canada and usually takes stance on the crackdown on the media and activists, the agency said. “I have left my home, my family and my job, and I am raising my voice,” he wrote in September 2017. The Washington Post has called for the Saudi journalist’s release noting that his detention is unfair and outrageous. ““We are monitoring the situation closely, trying to gather more information. It would be unfair and outrageous if he has been detained for his work as a journalist and commentator,” said the Post’s international opinions editor, Eli Lopez. Khashoggi’s disappearance follows the arrest last week in Saudi Arabia of economist Essam al-Zamil. Zamil who is a friend of Khashoggi, has been charged with joining a terrorist organization, meeting with foreign diplomats and inciting protests. Saudi Arabia has stepped up clampdown on critics and dissenters. Dozens of activists including several women who called for the end of ban on women’s rights to drive have been languishing in prison. In November, dozens of business tycoons including 11 Princes were locked up on corruption charges. Majority of them have been so far freed after signing monetary agreements with the government.